A palindrome is a word or phrase that is spelled the same both forward or backward - like taco cat or as I pee sir, I see Pisa. The name of today's Nice Price or Crack Pipe BMW is a palindromic 535, but could you go either way on its price? No two ways about it, yesterday's wine-colored '93 Audi S4 brought its seller an 85% Nice Price win, despite ominous rumblings about its relatively low cost of entry being only the tip of the Teutonic iceberg when likely future mechanical repairs were taken into account. While six years more senior, maintenance on today's BMW e28 535is shouldn't be much of an issue as its reverent current owner provides a litany of parts that have been either updated or replaced outright over the past half decade. It's almost as though he has jacked up the radiator cap and then drove a new car in underneath. Now he's moving to back home to Australia and needs to part with the car before parting these shores. As noted, the car comes with pretty much every consumable renewed, a good thing considering both its 191,000 mile life and the evanescent nature of some e28 parts - notably the wear points of the suspension. The engine isn't typically as ephemeral, the seven main SOHC six being a particularly robust motivator. The M30B34 - despite the 535 nomenclature - displaces 3,430-ccs making it closer to a 3.4 litre, and in U.S. guise it produced 185-bhp. This one's M30 benefits from a 5-speed manual having its back and a 3.78 rear-end sending the power to the wheels. Unfortunately, those spiffy BBS alloys in the pics don't come with the sale, but the prospective buyer can look forward to a set of style 5s, which, the seller reassures, do. Other exterior accouterments are the M-Tech body additions, M5 blackout window frames, and body-colored - in Zinnoberrot - door pulls. The only truly questionable addition is that kevlar wing weighing down the trunk lid. The seller claims that its installation interfered with the factory radio antenna placement, which has been removed and welded over before the car received a partial respray. It's up to you to determine if that was an equatable trade. The seller doesn't yet provide any interior shots, stating down the thread that he's waiting to have it detailed before doing so. If the insides look anything like the exterior, then it'll be worth the wait. He does note that the dash does sport a crack in it, and as it's not anywhere near as appealing to view as Jessica Alba's coin slot, he keeps it covered with a dash mat. Other issues are some clear coat pee lon the C-pillar, a brake warning light that he claims is crying wolf, and a knock-knock joke from the rear end. The 535is edition of the e28 is relatively rare in the States, the majority of those sold here seemingly being the son, I am disappoint, 528e editions. Those cars were like the BMW equivalent of Applebee's food, and were part of the company's ‘80s effort to combat their reputation for putting performance over fuel efficiency. The freaky 524td diesel was another, and both were sold alongside the 535i which, unapologetically, would leave each of those in its dust, even if it had to make more trips to the pump. This one's not only near the top of e28 performance food chain - the single-year and much more expensive to maintain M5 standing alone on its shoulders - but it's been owned by someone who obviously takes both great joy and pride in its stewardship. That is evident in both the fact that he has eschewed the broader reach of Craigslist or eBay for the narrower, but more appreciative confines of mye28.com to market his ride, and that he's asking $6,500 for a car that's obviously been a labor of love. 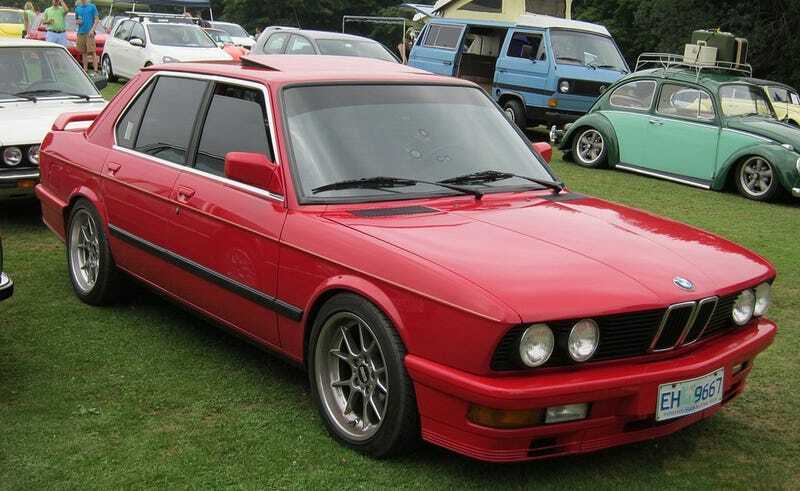 What do you think, is that price for this hot e28 something you wouldn't have to labor to love? Or, is that just not the sum of its parts? mye28.com forums or go here if the ad disappears.